A new visitor destination is being championed for Shropshire that will capitalise on the appeal of one of Britain’s nest hillforts. New group, the Oswestry Heritage Gateway, has revealed that it is talking to local organisations and stakeholders on plans to reimagine and promote the historic northern gateway to Oswestry. This refers to a corridor extending across the northern fringes of the town incorporating Old Oswestry hillfort and its hinterlands, Wat’s Dyke, the Cambrian Railway, Park Hall, Whittington, and the surrounding scenic countryside. The Oswestry Heritage Gateway aims to retell the story of this enigmatic landscape, which is imprinted with 3,000 years of borderland history and con ict revealed in a wealth of relics and legends. These range from forts, castles, linear earthworks, ancient trade routes and Arthurian tales, to medieval marketplaces, feats of Victorian engineering, and World War heritage linked to war poet and son of Oswestry, Wilfred Owen. 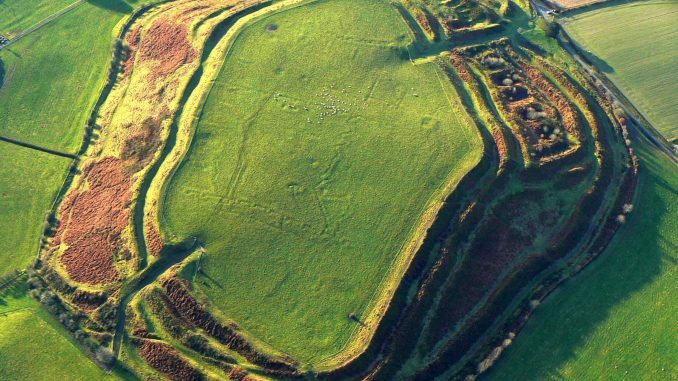 At its centre is Old Oswestry, regarded as one of the nation’s most important hillforts for the understanding of Celtic Britain and described as “The Stonehenge of the Iron Age”. The project is hoping to realise new economic opportunities for Oswestry from heritage tourism, networking with current tourist attractions and heritage interests in the area. It also re ects the desire of the local community to celebrate, promote and enhance current knowledge of Old Oswestry, creating a lasting legacy for generations to come. A spokesperson said: “The Oswestry Heritage Gateway is seeking to harness nationally important historical and cultural assets as a catalyst for new tourism and economic opportunities for the town and surrounding settlements. It o ers huge potential to reinforce the area’s appeal as a visitor destination in its own right, by promoting the area to tourists who are already travelling along the A5 corridor to the World Heritage Site attractions at Chirk and onwards to North Wales. The group believes there is also scope to develop wildlife, environmental and recreational initiatives to enhance the quality and experience of the Gateway for residents and visitors alike. An inaugural meeting is being held on July 10 at Hermon Chapel in Oswestry, starting at 7pm. Individuals interested to nd out more and become members are welcome, as are organisations and businesses with ideas to help develop a vision for the Oswestry Heritage Gateway. Further information is available by contacting ohgateway@gmail.com or 01691 652918.